Early in 2014, those of us at Classic Elite Yarns began talking about a different way to work with independent designers. We hadn't quite figured out what that "different way" would be when Talitha Kuomi approached us, asking if we had thought about working one-on-one with an indie designer. The time was right to jump in and figure out the details, and Tal's vision of Artistic Differences* was born! You may be familiar with Talitha's work through The Fiber Factor's first season. You can read more about Talitha here. Tal has also contributed many designs to CEY pattern books and I love her creative style - her ability to make a simple garment or accessory unique and different, by just adding small details. Her concept for Artistic Differences, taking one design and altering the details to make it fit your style, inspired by her two muses - an edgy rock 'n rock chick, and a more dreamy bohemian, hippy girl - seemed a perfect way to showcase her creativity and design aesthetic. 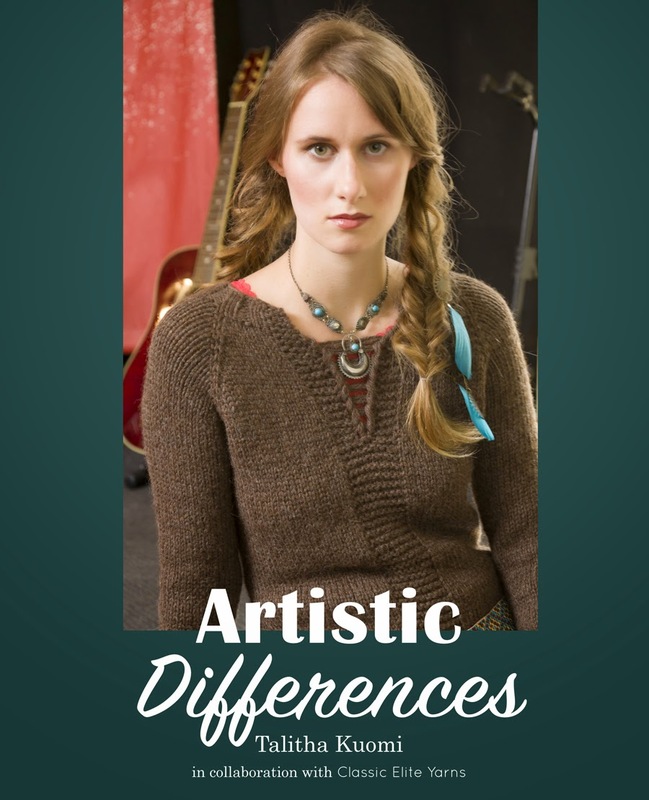 Below are just a few of my favorites from the ten projects in Artistic Differences, each shown two ways. Forte is a pullover knit in Blackthorn, with a unique drop stitch V-neck. The Boho version (left) has a higher V, and is shown worn with a wide beaded belt. The drop-stitch V-neck on the Rocker version is much deeper (right). Both are standard fit - a couple of inches of ease - but would have even another look if worn more oversized. I am in love with the Tensity bag! The only reason I haven't cast on yet is that I can't decide which color of Wynter to use. Both versions are knit exactly the same. The difference is in the hardware, which is available as a kit from JUL Designs. Choose from a classic shoulder bag or a backpack-type shoulder sling bag. 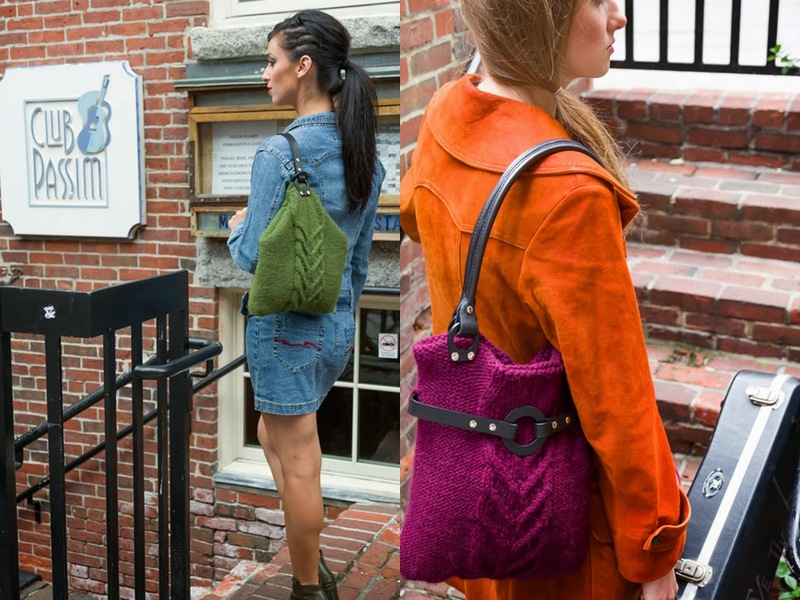 The cabled outer layer and the lining are knit in one piece for a bag with more stability than most knitted bags. 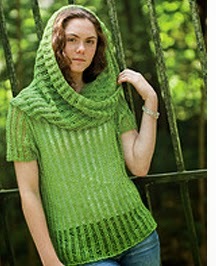 Tal suggests the option of knitting the lining in a contrasting color. 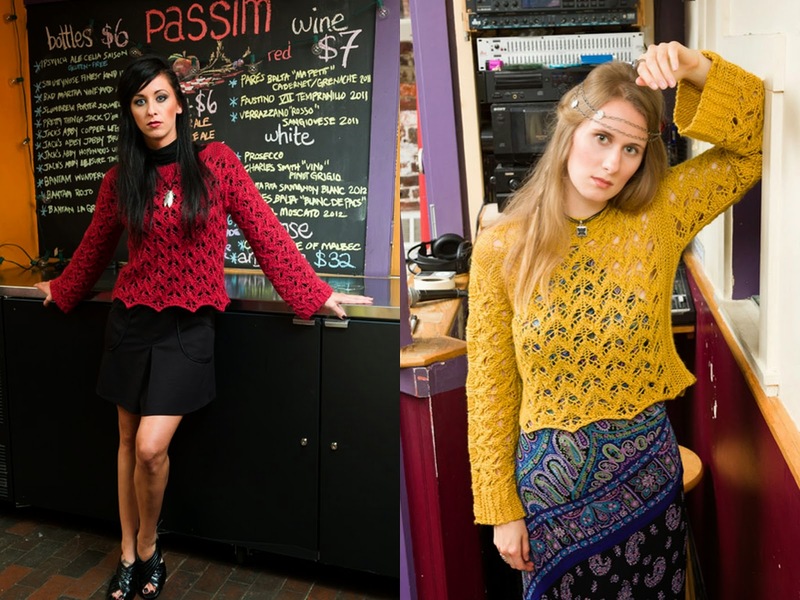 What I love about Artistic Differences is that by showing more than one way to knit and wear a sweater or accessory, it gives the knitter even more ideas for options in making each project perfectly suited to her own particular style. 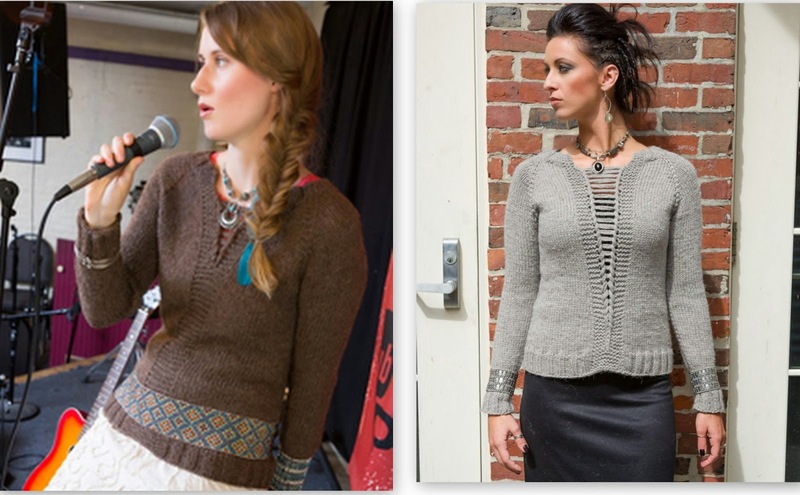 * The entire collection and individual patterns will be available January 1, 2015! Stunning pullover! Love that bag, too!